The final class of Imperial German great cruisers (as battle cruisers were known) would never have a chance of completion. Even as the architects finished the drafts in February and March 1918, the huge GK4541 design was labelled a paper project. That didn’t stop us from including her in Great War at Sea: Jutland 1919, an expansion book for Jutland centered on exactly such paper projects that would never actually be built. 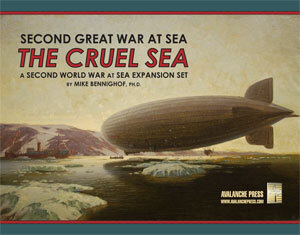 And since our Second Great War alternative-history story arc posits a world in which these ships would have been designed after the end of the First Great War, they also are assumed to have been built then as well and so they appear in Second Great War at Sea: The Cruel Sea. With airships and their attendant airplanes having taken over scouting duties for the High Seas Fleet, by 1940 the battle cruiser no longer has a distinct role in German naval planning (and hasn’t for over two decades). In the years before, during and just after the Great War, Germany built battleships and battle cruisers because the Reichstag funded them separately. Eventually the politicians saw through the scheme, but naval armaments treaties gave incentives to build battle cruisers in some fiscal years in place of battleships. In the Second Great War’s history, two GK4541 battle cruisers would have been laid down in the 1919 fiscal year (along with the final pair of gigantic L20e battleships), and two more under the next year’s budget. They would likely be completed in 1923 and 1924, after the naval limitations came into effect (in this reality, no ships already under construction would be stricken). As built, they would number among the world’s largest warships, displacing 45,000 tons (the equivalent battleships, the L20e design, weighed in at 42,000 tons). That massive size proved necessary to fit a power plant large enough to generate the desired high speed (a projected maximum of 30 knots). The ship featured a mix of oil- and coal-fired boilers, with the coal bunkers worked into her protection scheme. Outwardly, the GK4541 looked a great deal like the L20e battleship (which also appears in both Jutland 1919 and The Cruel Sea), and sacrificed no protection for her speed – armor in most places was slightly thicker in the battle cruiser design. Like the battleships, the battle cruisers carried eight 420mm (16.5-inch) SK L/45 naval rifles in four twin turrets. They added eight 150mm guns in an armored casemate, and four more in deck mounts, plus a single torpedo tube in the bow. The German naval staff expected future naval battles to be fought at extreme range, and for the first time German naval architects tried to deploy a weapon that would give them an edge over the British; unknown to them, the Royal Navy had already tested an 18-inch gun and sent it to sea in the battle cruiser Furious (just one ship, with just one gun, and just for a few months, but the threshold had been crossed). In our alternative history, the four battle cruisers would be taken in hand for reconstruction in the mid-1930’s. They would need more horsepower to maintain their speed, which would require a changeover from coal to oil as their power source; with their Ottoman allies providing a secure source of petroleum, this presented far less of a strategic risk than had been the case in our own 1918. Removing the coal bunkers would require the fitting of additional armor, and the armored decks would need strengthening in any event. 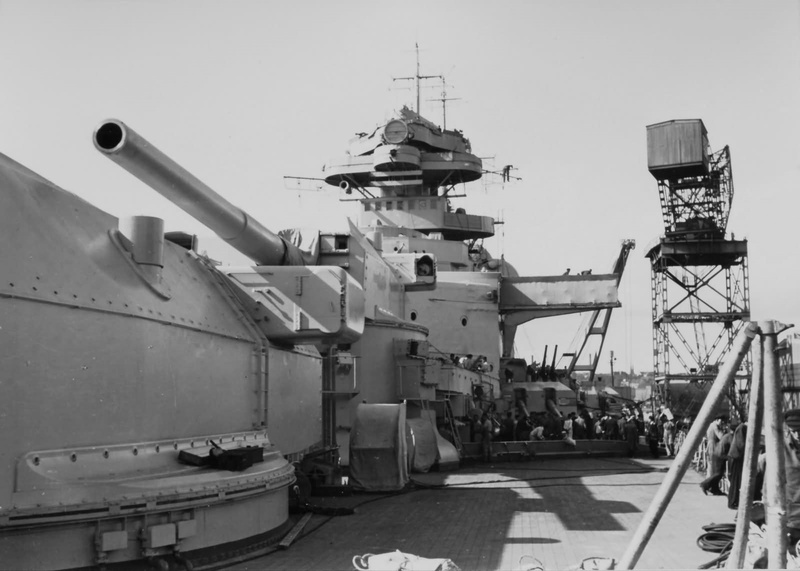 Outwardly, the 150mm secondary battery would retain its dozen guns, but the more effective L/55 model would now occupy six twin turrets, three on either side of the ship. Like the battleships, they would receive an anti-aircraft battery of eight 105mm guns in four twin mounts plus an array of light guns. And they would lose their torpedo tube. Despite their gargantuan size, the ships’ layout would leave no obvious spot for a helicopter pad and hangar. In The Cruel Sea the big Victoria Luise class ships (they bear the names of older German cruisers, having never received any in our world) are usually deployed forward, though they can also operate with the newest fast battleships. The High Seas Fleet also includes battle cruisers built to the “cruiser killer” design pushed by Admiral Hans Zenker during the Weimar Republic years, but none of these appear in The Cruel Sea as they’re deployed on distant foreign stations. The Germans do receive a trio of modern battle cruisers, what we’ve called the Scharnhorst class and named Scharnhorst, Gneisenau and von der Tann. The National Socialists never named a ship for the doughty Great War battle cruiser von der Tann; Zenker commanded her during the First World War and Nazi Grand Admiral Erich Raeder deeply despised his old boss (which speaks well for Zenker’s character). They’re an enlarged version of the Scharnhorst built under the Nazi regime (the revised version intended to carry six 380mm guns), armed with six 420mm guns in three twin turrets. They would need the greater size not only for the big guns, but to accommodate a much larger power plant, powered by conventional boilers rather than the notably unreliable high-pressure steam plant of the Nazi Scharnhorst. The second battle cruiser von der Tann’s forward battery. Like the other German battleships and battle cruisers, these ships would have two secondary batteries: eight 150mm guns in four twin turrets to engage surface targets, and eight more 105mm guns in high-angle dual mounts to provide heavy anti-aircraft protection plus light guns for close-in air defense. Like other German capital ships, they have no torpedoes. A helicopter pad atop a hangar occupies a spot just forward of the aft main gun turret, with a small workshop as well to support the aircraft. The three big cruisers are among the fastest heavy warships in the game, with a good balance of firepower and protection to go with that. These ships would have been among the last new large ships completed before the outbreak of the Second Great War. They see a great deal of action in The Cruel Sea, both as surface raiders seeking French shipping and as part of the reaction forces trying to seek out French surface raiders.